The JF-17, or the FC-1, is a single-engine multi-role light fighter jet jointly developed by China and Pakistan for export, according to the website of the Aviation Industry Corporation of China. (Agencies)- China and Pakistan have begun upgrading their jointly developed JF-17 fighter jet, the current version of which was reportedly used by the Pakistan air force (PAF) in the dogfight against Indian fighter aircraft near the Line of Control (LoC) last month. "The development and production of the JF-17 Block 3 are underway," Yang Wei, a Chinese legislator and chief designer of the China-Pakistan co-developed fighter jet, was quoted as saying by the state media. The F-16 was part of the two dozen fighter aircraft that PAF had scrambled during the dogfight with the IAF. The current version is said to be a contender of India's indigenously developed Tejas aircraft. Yang said his aim is to enhance the jet's "informatised warfare capability and weapons" or the use of cutting-edge communication technology in modern warfare. "All related work is being carried out," Yang was quoted as saying by the nationalistic tabloid Global Times at a press conference held on the sidelines of China's ongoing Parliament session. The JF-17, or the FC-1, is a single-engine multi-role light fighter jet jointly developed by China and Pakistan for export, according to the website of the Aviation Industry Corporation of China. Yang added that the development and batch production for the JF-17 Block 3 aircraft were going on simultaneously. "The third block will see the JF-17's informatised warfare capability and weapons upgraded," Yang said. 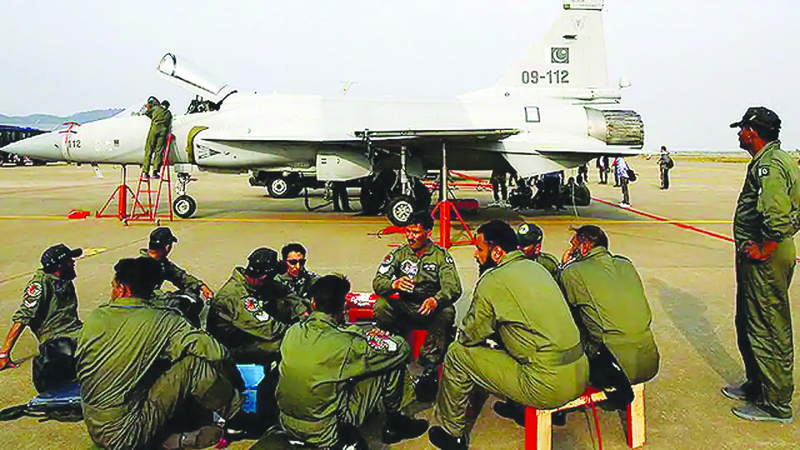 Pakistan, the main user of the JF-17, could further share information between the fighter and other platforms, taking advantage of the whole combat system to effectively defend against strong opponents like India, a military analyst Wei Dongxu was quoted as saying. Wei explained how the upgraded version would be put to use against the IAF. "JF-17 Block 3 is expected to be fitted with an active electronically scanned array radar, which can gather more information in combat, enabling the fighter jet to engage from a farther range and attack multiple targets at the same time. A helmet-mounted display and sight system could also allow pilots to aim whatever he sees," Wei said. Once the new upgrades are ready, they can be fitted on the airframe very fast, ensuring a quick delivery time, Wei added. According to the tabloid, the JF-17 is often described by its manufacturer and military observers as an advanced but also a cost-effective fighter. "It is currently contending with India's Tejas and South Korea's FA-50 in Malaysia's new fighter jet purchase plan, with the JF-17 being the most competitive option," Wei said. Myanmar and Nigeria have reportedly purchased the Chinese-Pakistani warplane.